The Japan Meteorological Agency (JMA) is preparing to go live with a newer and better meteorological satellite service this year. Artistic rendition of the Himawari-8 + -9 satellites. Adding management, optimization and automation is KenCast’s Fazzt Enterprise Content Delivery solution, which offers the flexibility to support a transition that considers old and new data and sources as well as a proven track record in weather systems. Similar to other satellite datacasting services, such as the National Oceanic and Atmospheric Administration (NOAA) GEONETCast Americas service, Fazzt is a key component. Since 2014, the JMA and partner Rikei Corporation have been collaborating with KenCast® on this new data delivery service, which will go live early this year. The JMA’s HimawariCast service is a transition away from existing MTSAT LRIT and HRIT services. The new service will provide more frequent and better imagery, and will do so every 10 minutes, to improve accuracy and usefulness of data. One use of this system, among others, will be the datacasting of JMA’s meteorological satellite imagery and related products. This will be a free service to users within the multicast footprint. The JMA has produced data manipulation software, including KenCast Fazzt scripts, which will be provided through their website—once again, at no charge. For additional details, please refer to the JMA. 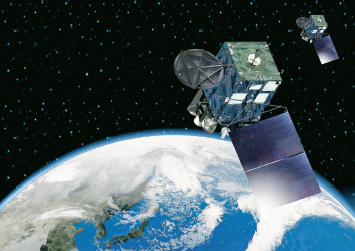 The Japan Meteorological Agency (JMA) is preparing to go live with a newer and better meteorological satellite service this year KenCast’s Fazzt Dual Node Enterprise Server will provide resilience and easy maintenance through redundant design. 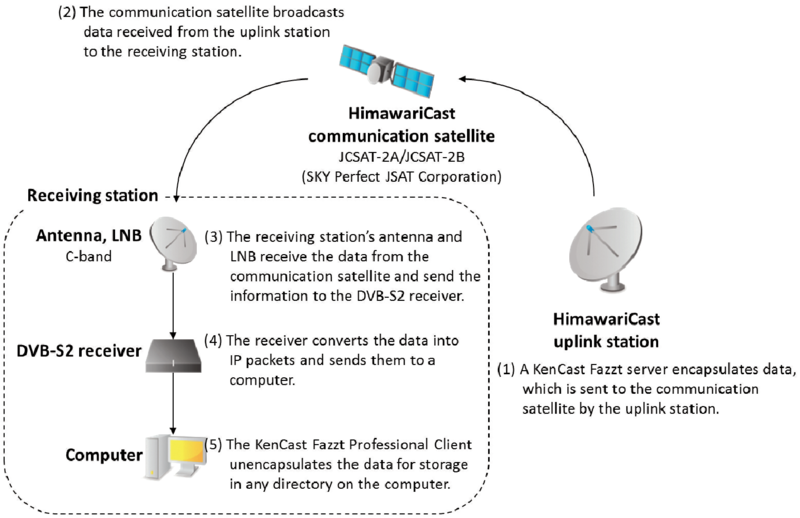 The Fazzt Enterprise Server™ software with Fazzt FEC® (Forward Error Correction) drives satellite multicasting and also leverages server-side Fazzt scripting to manage and automate data delivery of HimawariCast data. Interested recipients with the correct gear and a personal computer with the Fazzt Professional Client™ can receive the data. Fazzt client-side scripts have also been created to work in concert with JMA programs to optimally manage and display the data. “The investment in, and cooperation on, weather data satellite systems by the USA, Japan and other countries, has been impressive and improves the world’s emergency preparedness, among other benefits,” said KenCast CEO Bill Steele. “The U.S.’s GEONETCast Americas and Japan’s HimawariCast projects bring the global community closer together, all the while increasing safety, weather accuracy and more,” he added. GEONETCast Americas, a service managed by NOAA, is the agency’s broadcast stream that covers the Americas. NOAA is the satellite data provider for GOES, POES and NOAA-NESDIS (National Environmental Satellite, Data and Information Service) atmospheric and marine data products. The JMA’s HimawariCast service will disseminate environmental data in a large footprint for the Asia Pacific (APAC) region. As with GEONETCast Americas, no registration is required and users may simply tune in to the datacast, although registration at the website is possible in order to receive updates by email. “The JMA hopes the HimawariCast service will be widely used and contribute to disaster risk reduction in the Asia Pacific region,” said KUMAGAI Yukihiro, Satellite Program Division, JMA. The DTE-800850, an outdoor, antenna mount unit covering 8.0 to 8.5 GHz in 1 kHz tunable steps. The IF is 70 MHz or an optional 140 MHz. The small, weatherproof package is only 3" high x 10.6" x 12.8" mounting area. The DTR-800850 is a 1RU rackmount downconverter version of the DTE-800850. 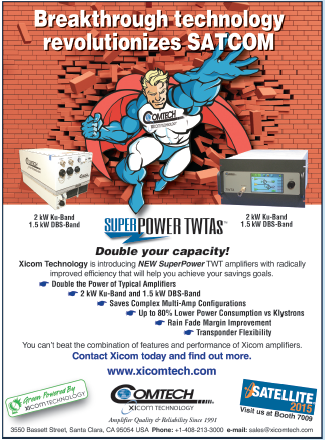 Both models are part of a series of Up and Downconverters covering L-, C-, X-, Ku- and DBS SATCOM bands using precision, low phase noise synthesizers for optimal performance. Both models come with 10/100BASE-T Ethernet interface along with RS485/RS422 serial interface. Lockheed Martin and Esri have deployed commercial software to the Amazon Web Services Commercial Cloud Services (C2S) environment for the first time with an intelligence community customer, the National Geospatial-Intelligence Agency (NGA)—the move enables government agencies to better share geospatial intelligence. The deployment of the portal for Esri's ArcGIS geographic information system (GIS) provides a single environment for analysts to securely organize and share data throughout the intelligence community and Department of Defense. It's also the foundational step in consolidating multiple geospatial intelligence portals into the single NGA-provided portal, resulting in technology and license cost savings. This is NGA's second pioneering step in the cloud, after the agency moved its Map of the World application to the C2S environment late last year. "Deploying Esri's Portal for ArcGIS to a commercial cloud environment securely organizes existing data and facilitates collaboration across intelligence agencies," said Jason O'Connor, vice president of Analysis and Mission Solutions for Lockheed Martin. "This cloud implementation also further shapes the government's processes for architecting and implementing enterprise class services within a cloud environment." "Working with Lockheed Martin and the NGA on this strategic implementation for national security is particularly meaningful," said Jack Dangermond, Esri president. "It recognizes the importance of consolidating geospatial intelligence information into a single portal to facilitate rapid situational awareness and response by our intelligence community." Lockheed Martin and Esri have partnered for eight years on the Geospatial-Intelligence Visualization Services (GVS) program, which helped NGA and the Intelligence Community achieve this cloud migration milestone. The Total Application Services for Enterprise Requirements (TASER) GVS contract vehicle, which was originally awarded in 2012, conveys geospatial visualization context and analytic capabilities to warfighters, intelligence officers and policy-makers through classified and unclassified computer networks. 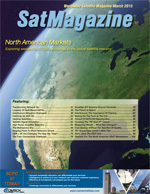 NovelSat has announced that satellite services provider SatLink Communications has acquired a sizable quantity of NovelSat NS300 satellite modems to enhance the satellite communications solution offering for their maritime customers. SatLink Communications, a global teleport, content management and HD Playout services provider, offers their maritime customers triple play solutions, broadcast and VNO services. NovelSat, a longtime SatLink partner, has delivered their NovelSat NS300 Professional Satellite Modems to replace existing KU band-based systems and for implementations with new customers. The SatLink solution takes advantage of NovelSat DUET CeC (Channel Echo Cancellation). This technology effectively doubles channel capacity in bi-directional satellite links with no need for additional hardware. NovelSat NS300 Professional Satellite Modems are compatible with all satellite industry standards including DVB-S and DVB-S2 and offer NovelSat NS3. 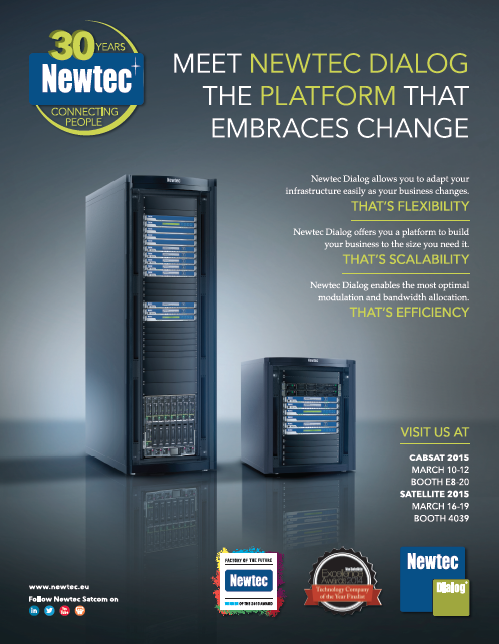 NovelSat NS3 is an optional software package that typically delivers more than 30 percent improvement in spectral efficiency compared with DVB-S2. Norsat International Inc. has announced that a Tier 1 Eurasian defense contractor has signed a $3.5 million agreement to purchase a range of Norsat's portable satellite terminals to provide high performance military communications for an Eurasian Ministry of Defense ("MOD"). This order highlights the broad capabilities of the company's product offerings, including the adoption of one of the company's newest innovations, the 0.9m Journey Manpack terminal. As part of this agreement, the customer will purchase multiple products from Norsat including the recently announced 0.9m Journey Manpack, the 1.2m Rover™, the 1.8m SigmaLink™ terminal, the 1.2m VSAT antenna bundle, as well as the 0.75m and 1m shipboard terminals for the Army and Navy. This broad portfolio of satellite technology showcases Norsat's ability to deliver a full solution to its military customers. 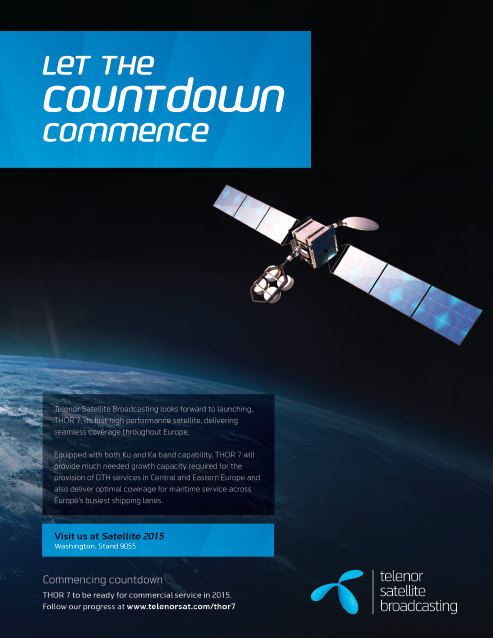 Norsat expects to ship the majority of the terminals in late 2015 with follow on deliveries throughout 2016. The 0.9m Journey Manpack consists of an easily portable, rapidly deployable, satellite terminal that weighs less than 25 kilograms. The Rover is an ultra-lightweight fly-away satellite terminal with unsurpassed reliability, advanced assisted-acquire technology, and a flexible deployment platform. The SigmaLink is a transportable satellite terminal ideally suited to provide broadband connectivity for base camps or other prolonged missions where assignments are temporary, but deployment is protracted. 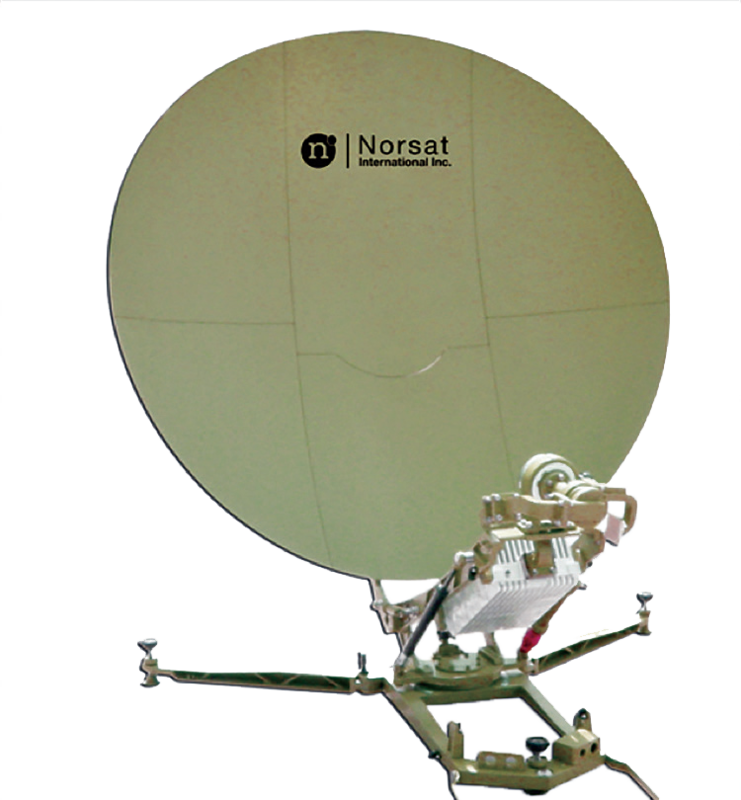 Norsat's VSAT bundle is an easy to use fixed satellite terminal that provides data connectivity to remote areas for Internet connectivity. Norsat's MarineLink shipboard terminals offer a 3-axis operating platform and a 360 degree highspeed tracking antenna that ensures a reliable link in even the most difficult sea conditions. Dr. Amiee Chan, chief executive officer of Norsat, said, "Over the last number of years, we have made concerted efforts to invest and develop technology to further diversify our product offerings to meet the expanding needs of customers around the globe. This order is the culmination of more than two years of work and reinforces the expanding strength that we believe is capable from our military business moving forward."